This issue started in August, and has continued until now up through version 90.7. Nothing about my printer is saved after rebooting the raspberry pi repetier-server is running on (I'm running the full Linux package, not the rpi image). Changes to the extruder/bed temps doesn't stick, and neither do any gcodes or print logs. I can upload and print the gcode and change configuration settings just fine, however as soon as I reboot the server everything is lost. 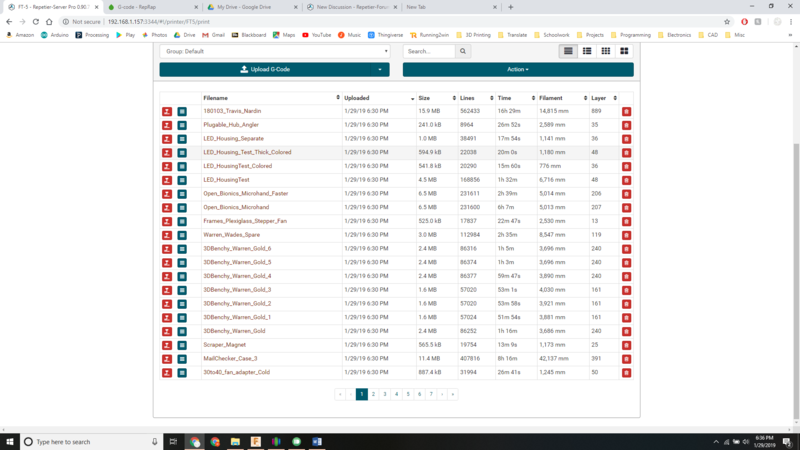 After doing so, all the gcode files and settings that do remain (the ones that were on the rpi before this issue started happening) are somehow grouped by upload time, with each group saying that they were uploaded at the exact same time (8/9/18 1:19pm, and some at 1/29/19 6:30pm). These were the dates and times that I updated the software, so it is clear that they are due to something amiss with the latest firmware releases. Any thoughts? See the attached screenshots for more explanation. Do you always shutdown the pi before unpowering? If you don't you can get a corrupt filesystem that deletes new files after reboot and filecheck. Have see it live and it is nothing server related. In that case we could create a file in a directory and see it, after reboot it was simply gone. So make a backup of /var/lib/Repetier-Server and anything else you changed, upload a new image and copy files back or put it on new sd card. Then the problem should be gone. I do tend to just unplug everything when I'm done, and I can see why that might be bad . I'll reflash everything and then copy over the old configuration. Most of the time you get away with that especially since we do a disk repair on every startup. But somehow it seems possible to get that error. Also make sure you have free disk space. That can also lead to unexpected problems.